Sunray Group has won the bidding for the highly coveted Delta Toronto East Hotel and development property after a court-ordered wind-up of the assets of previous owner Tarn Financial Corporation. “There was a tremendous amount of interest in the property from local, regional, national and international investors,” said Robin McLuskie, managing director of hotels for Colliers International, which was retained by KPMG in its capacity as court-appointed liquidator of Tarn Financial. Alam Pirani of the Colliers International hotels team and Stephen Ho of the Colliers International services group led the sale. “There was solid interest in the offering, given the strong appetite for investment opportunities in the GTA and lack of available product,” said McLuskie. The sale price of the Delta Toronto East Hotel property is confidential. CFO Capital president and principal broker Mark Kay and his team arranged financing for Sunray Group’s acquisition, as well as capital expansion for coming renovations and a conversion from the Delta brand to Sheraton. “The hotel is fully operational and will remain open during renovations,” said Kay. “Sunray will be conducting a significant repositioning and capital plan over the next year that will meet and exceed the brand standard. The property at 2035 Kennedy Rd. includes a full-service hotel with 366 guest rooms and more than 32,000 square feet of meeting space on 6.9 acres. McLuskie said the renovations should increase occupancy and room rates at the hotel to provide strong and stable holding income for Sunray Group while it develops the rest of the site. – and a multi-level, above-grade parking structure. Sunray Group is a privately owned, multi-faceted corporation specializing in hospitality and development. It owns and operates 37 hotels in Ontario and Quebec and has partnerships with brands including Marriott, Best Western, Starwood, IHG, Hilton and Choice Hotels, as well as with Tim Hortons, McDonald’s, Shell and Petro-Canada. 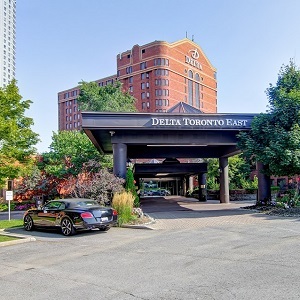 Tarn Financial had acquired the Delta Toronto East Hotel property in 2014 with the intention to build The Kennedys Condominiums at the site. All of the units proposed for the condo development were sold. However, a disagreement between Tarn Financial’s shareholders resulted in a judge ordering the company to be wound up and the property liquidated. People who paid deposits for the condo units had their agreements nullified by the court and are being refunded as part of the liquidation process, according to Kay.